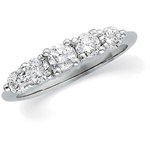 A gorgeous accent to any engagement ring, or a wedding band that can be worn all alone. 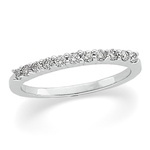 A classic wedding or anniversary band with choice of round, princess, or emerald cut diamond. 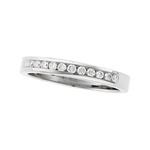 This wedding band has some serious stones, all genuine diamonds mounting to 1/2 carat total weight. 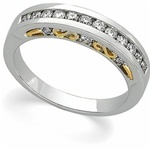 A wedding or anniversary band that has subtle differences and craftsmanship to set it apart from the rest.